So where are the best places to pop some tags? Here are a few, IMHO. 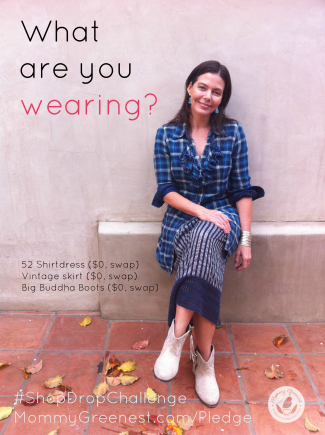 Unlike eBay, which can be hard to navigate, I-Ella makes it easy to buy, borrow or swap clothes. Sort by designer, trends, size or real women’s closets—my closet was featured a few years back—then click on an item you like and a popup tells you the retail price and what the owner wants in exchange. Plus, a percentage of proceeds benefits the charity of your choice. With 32 locations across the country—nine in the Bay Area alone—Crossroads dominates the national upscale thrift store market. Crossroads stores are clean and well-merchandised, and you can score designer goods at a fraction of what you’d pay at retail—many still bearing their original tags. One caveat: Crossroads also sells new clothes, so make sure you’re in the pre-worn section. Where are the best places to pop some tags? Here are a few, IMHO. From online to national to totally unique—if you’re thrift shopping, I’ve got you covered. And I scored you 15% off at the best of the best! Nestled in an up-and-coming Santa Monica neighborhood, swapping at this store is like sharing a closet with 400 other women who have far better taste than me. You pay a nominal membership fee, bring in your clothes to swap and get their value in the store—all you have to pay is tax! I don’t know of another swap shop like this, do you? Let me know in comments if you’ve found one! Give + Take now features a consignment section so you can also shop without being a member. But regulars take their membership seriously—you can’t visit the shop for long before someone shopping next to you points out that you’re wearing her old necklace. And because everything is completely returnable—as well as constantly being returned—you can take fashion risks that would never be possible in a regular store. Like the pleather pants I rocked at last year’s Mommy Greenest holiday party, which we held at—you guessed it—Give + Take. Yes, the Wasteland on Melrose looks like an Anthropologie flagship, but then you have to deal with the cooler-than-thou sales staff, too. At The Closet Trading Company in Santa Monica, you can score everything from Isabel Marant to Missoni, and they specialize in great deals on high end exclusives—think a Helmut Lang sweater for $50—but there are plenty of mid-range labels like Kate Spade and Rebecca Taylor, too. My favorite thing about the store is how they cull the new arrivals into a separate section, especially for us regulars who tend to drop by a few times a month (read: week). And the salespeople are beyond friendly—they’re more like personal shoppers, suggesting styles and accessories, letting you dig through boxes of clothes that haven’t yet hit the shelves and occasionally cranking up tunes for an impromptu dance party. This is how nice they are: When I told The Closet peeps about this month’s Shop Drop Challenge, they offered a sweet 15% off now through 2.28.14. Just use LABEST15 at checkout when shopping online at TheClosetSB.net or if you’re a walk in, tell them you read about The Closet because of the Mommy Greenest Shop Drop Challenge, and they’ll hook you up! Why the Shop Drop Challenge? The average American woman spends $60 per month on clothes and dumps six pounds of textile waste into the trash. If we all got together for a shopping pause, we could save nearly $10 billion and one billion pounds of landfill waste. Yes, that’s billion with a b. We’re creating a community of women who have pledged to buy no new clothes or accessories for the 30 days of January and are inspired to thrift and swap their style this month! Thrifting is the the new word for second hand shopping. While I’m glad it is finally more acceptable, there are still lots of people who would never buy used clothing, Others will only shop at the “cool” places. I have been doing this all my life ( I’m 64) and would love to share a few tips and thoughts. I do not buy new clothes because I know I can find it used and save tons of $$. If you are looking for the latest trend, or want a specific garment, thrifting may not be for you. Remember, if you bought it new, wear it, and take it off….it’s used! Buy basic colors. Solids are the first choice. You can mix and match, add scarves and jewelry. (Also at thrift stores) Prints can make an outfit, but limit those . Take your time, and get a cart! If you go to Goodwill, Salvation Army or a store that takes donations be prepared to spend some time. They may have them by category ( blouses, sweater, pants, etc) but that’s about it. They may not be sized. Do not be overwhelmed! Go to the section you want and start flipping hangers. See something? Throw it in the cart and keep going. When you get to the end of the rack, look in your cart and weed out. Buy it when you see it! It doesn’t matter if it’s the right season, if it’s fab, and a great price, get it or it will be gone. Check the label. Not all companies make great clothes, and just because you’ve never heard of them doesn’t mean they’re not well made. Check workmanship. Is it well made? What do the seams look like? Are there holes or stains? Look under the arms. Most stores do not accept returns so examine the garment. Go often. New items are put out daily. Don’t expect to find exactly what you are looking for the first time. Try it on if you can. Obvious reason. I could list so many great things I have found, but instead will just mention a few. Black silk Eileen Fisher coat with original tags. $5.38. Tommy Bahamas silk shirt $3.38. Cashmere sweaters …. ( lots of them). $3.38. Oh also, that 15% is for The Closet online too, so you can shop from anywhere. Happy thrifting! How did “America’s Best” become “California’s Best”? A more inclusive list would be most appreciated. Hi Tina! I included Crossroads since it’s national, as well as I-Ella for online national, and then chose the Closet as my local–as well as Give + Take because it’s unique to the whole country, I think! Sorry I couldn’t add more but I hope that you’ll use the comments to share your favorites in your ‘hood. Thanks for reading!